“It’s an election year at St. Edward’s University, as it always is,” Student Government Association Elections Commissioner Jonathan Edwards jokingly said, as he took the podium to debrief the senate on the upcoming election season. 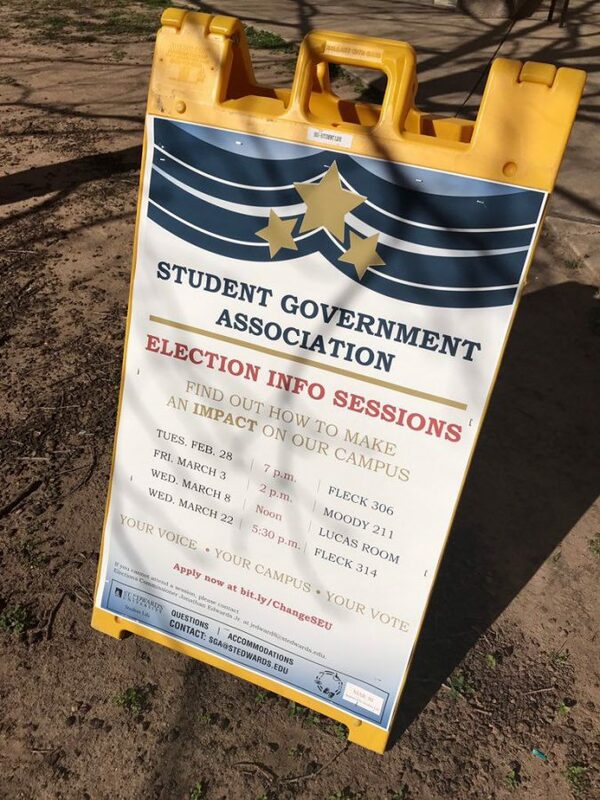 SGA will hold election info sessions over the next few weeks. The application link to run for a SGA position will be available until March 24 at 8 a.m. In addition to a 2.5 GPA requirement, Edwards is mandating that prospective candidates must attend and sign in at a formal senate meeting either March 9 or 23 at 7 p.m. in Fleck 305. This is done so candidates can be familiar with how SGA operates. Campaign week starts March 29, and voting week will take place the first week of April. In the past, presidential candidate debates and senator platform speeches would take place once ballots were already casted. Edwards said this change will maximize the amount of exposure candidates will have before students head to the polls. Sen. Miguel Escoto used pictures to aid his proposal that Residence Life should relocate an underused bicycle rack on the southwest side of John Brooks Williams-South (JBWS) to the Village residence halls where there are overcrowded bike racks. Sen. Carlos Alpuche mentioned there is a different bike rack on one side of JBWS that “was built a little too close to the building” and doesn’t allow bikes to be locked on properly, suggesting that this one could be moved instead. Sen. Jade Patterson asked, “What if the day we go to move that bike rack, one person’s lone bike is on that rack?” Escoto responded in saying SGA can simply place a notice informing bikers the rack will be relocated. The resolution was approved through first passage. President Jamie Cardenas thanked the senate for their involvement at homecoming festivities, and gave a reminder that university President George E. Martin will have a State of the Campus Address in Jones Auditorium April 5 at 6:30 p.m. Cardenas said the address will be followed by a panel that will focus on Title IX and sustainability. Cardenas said that her and Vice President Carlos Martínez have addressed the four pillars their campaign promised, which include student accessibility to SGA, student unity, campus safety and sustainability. Community announcements included a social media challenge to SGA from sophomore Lilli Hime, also the former Hilltop Views Life & Arts editor. Hime introduced her newly-formed organization “America, I Will,” which promotes discussion of social justice issues and participation in community service projects. Junior Katie Dube, a special education major, was inducted to SGA as the ambassador for the School of Education. Dube also serves on the Dean’s Leadership Council and is president of St. Edward’s Educators. SGA Advisor Carey Mays introduced graduate student Megan McBride to the senate, as she is assisting and learning about the role of an organization advisor. “This is always an exciting time for student government with elections coming up,” Mays said to close the meeting. The next SGA meeting will take place March 9 at 7 p.m. in Fleck 305.